When someone mentions working out, going to the gym or taking part in a circuit training class the first thing that enters most people’s mind is a push up or as some people call them, a press up. Push ups are probably the most globally recognized work out drill due to both the simplicity of the exercise and the range of muscle groups which can benefit from the activity. The immediate thought of most people when thinking about push ups is one of the muscles in the upper arm called the triceps brachi but there is so much more to a push up than working the muscles of the arm. Different types of push ups exercises can actually work four individual muscle groups, the abdominals, the deltoid, the pectorals and the aforementioned triceps brachi. The placement of the hands and feet contribute to the different variations of the action and this is how specific muscle groups are targeted. Section two of this article analyses the five main variations, discussing the best techniques to use when looking to target a specific muscle group. The whole article has been split into six sections each of which outlines a certain aspect regarding the perfect push up workout. Some sections are larger and more informative than others but all should be studied thoroughly in order to piece together the individual factors and maximise your perfect push up workout. Introduction – This section underlines the basic information regarding a push up, highlighting all you need to know before starting with the programme. Here the history of the push up is discussed, outlining the organisations which have adopted this exercise as part of their training programmes. Variations – As briefly mentioned in the early part of this article, there are a variety of types of push ups used to target specific muscle groups. Although the action of a push up uses the arms, adapting your body position and arm width can work other muscles as opposed to just the triceps brachi. This section outlines the various types of push ups listing the muscle groups targeted by each. Equipment – The appeal of a push in contrast to other workout exercises is that in its most basic form it doesn’t require any equipment. However since the turn of the century exercise equipment has evolved and this section identifies the equipment on the market which may assist with push ups. Programme – Here the information provided in the ‘variations’ and ‘equipment’ sections is combined as a push up exercise programme is produced. This section contains a brief programme, underlining where and when to use the different variations and how many repetitions and sets to do of each. Top Tips – This penultimate section includes any tips and hints which may be useful to help with performance when working through your perfect push up programme. The tips will help make your push up workout more comfortable and more enjoyable. Helpful Suggestions – This section includes information on how to get the best results from your workout. It discussed resistance and endurance, stating when and how to step up your workout regime. The position adopted to perform a push up is called the prone position, in simple terms the prone position is lying flat with your chest touching the floor. The actual movement involves raising and lowering the core of the body using the arms with the elbow joint acting as a hinge. Push ups are very popular for physical education in schools, sports training and basic to extreme military training. The use of push ups however is frowned upon in some circles as it is viewed as a form of punishment rather than a form of physical exercise. Some schools, sports training instructors and military training personnel do use push ups as a form of punishment, however this is for the benefit of the individual. Fitness expert Jack LaLanne set the first work record for push ups in 1956. The American successfully completed 1,033 push ups during a period of 23 minutes. The most recent record set for push ups was in 2007 when Briton Aman Sharma performed 1,940 push ups in a one hour period. Part of the appeal of push ups is that they are not sport specific and can be used as part of any physical training programme. They are a muscle endurance exercise however and over the course of time following a push up exercise programme will cause the working muscles to increase both in terms of size and strength. For strength based sports such as boxing and rugby this is ideal. Athletes from other sports such as athletics should only use push ups for fine tuning and conditioning. As outlined in various sections of the article so far there are different types of push ups. Some are general variations of the standard push up whereas others have been tweaked to target a wider range of muscle groups. Different organisations may have their own versions of the push ups included in this article but the top five exercises are described below. This is probably the exercise most people class as a push up. The standard push up involves the individual lying on their chest with their arms shoulder width apart, arms locked straight and feet raised using their toes. To perform a push up the individual then unlocks their arms at the elbow, lowering their head and upper body towards the floor. 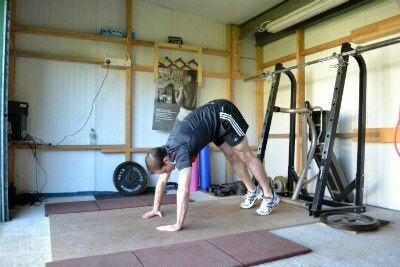 To complete a single full push up this action is then reversed so the elbows become locked once more. The standard push up works the deltoids, pectorals and triceps brachi all in equal measure. This variation looks to target the deltoids and the triceps brachi, dismissing the chest and abdominal muscles. The action of the exercise is performed the same as the standard except the hands and arms are tucked in tight, close to the body, this puts additional strain on the targeted muscles. This variation is pretty much the opposite of the narrow push up. Instead of the hands and arms being tucked in they are spread wide, this targets the pectorals. For best results it is recommended that hands are placed 12cm wider than they would be for a standard push up. This variation is great for those looking for a challenge but it is important to be safe with this exercise as performing it whilst carrying too much weight could cause severe back injury. The idea behind this exercise is that the individual is trying to push up their own body weight plus a little extra weight too. Small backpacks and vest packs are ideal for carrying weights and these should be used to reduce the risk of back injury. 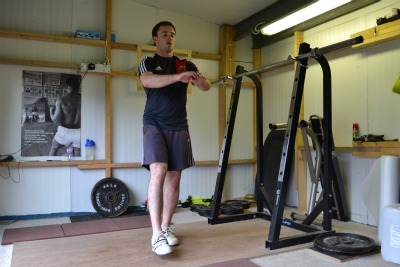 However be sure that too much additional weight isn't being used as this again can cause back injury. For safe exercising start off with a weight which is 5% of your body weight. This variation can be used to increase the difficulty of a standard, narrow or wide push up. By raising your feet onto a higher surface extra stain will be put on your arms, working the triceps brachi to a higher level of intensity. The ideal height for the foot raise is 12cm; this can be increased with time if needed. This variation was developed for pregnant women but also has a use for obese people who are not able to conduct a traditional push up but still want to practise the exercise. 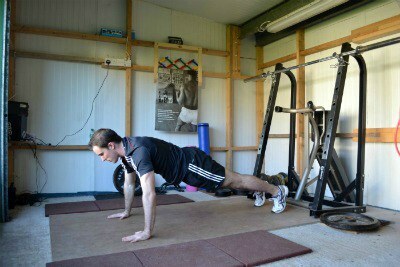 Check out our wall push up article to learn more about wall push ups. 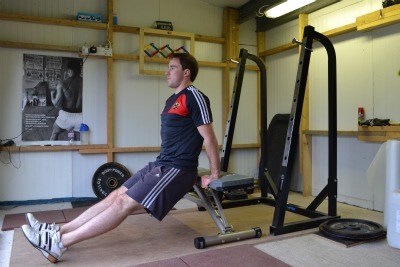 Although the five push up variations listed above can easily be performed without the need of any equipment, there are small pieces of apparatus on the market that can assist with push ups and improve performance. Although none are strictly necessary all are helpful and may be useful for those wishing to part take in an intense push up programme, helping reduce the strain on the feet and hands. These have been on the market in the United Kingdom for a number of years with a string of television commercials making them popular. These discs can be purchased online and have gradually been developed by a number of manufacturers, adding features along the way. The basic principle of using the disc grips is that they allow rotation whilst performing a push up, this helps the muscles take their usual form of an arc shape whilst doing push ups. As well as allowing rotation, these push up disc grips also take additional strain off the hands, wrists and elbows making push ups more comfortable as well as more beneficial. 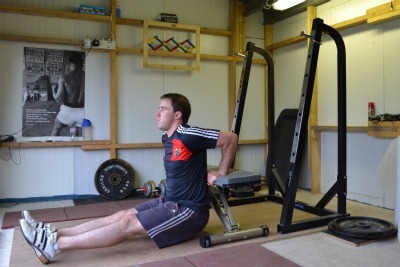 This piece of equipment has been introduced solely to improve comfort whilst doing push ups. Like the push up disc grips, these push up handles take the strain off the hands and wrists, allowing for more push ups to be completed, in comfort too. Although design specifically for comfort, push up grip handles do encourage users to perform to a higher standard, by raising the body further from the ground, the grips work the muscles harder, requiring more effort to low the weight of the body. The handles are very cheap and are produced by a number of sports equipment manufacturers. 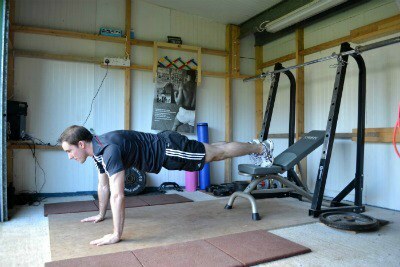 Not a piece of equipment most people would associate with push ups but an exercise bench is ideal for lifted push ups. Most exercise benches can be adjusted to different heights; this would be perfect, allowing the height of the feet to be slowly increased throughout an exercise programme. For those looking to incorporate push ups into a larger exercise plan, an exercise bench is a must buy. There are endless exercises which can be done using the assistance of an exercise bench and these work muscles across the body. After thorough research and analysis of existing push up programmes the following 12 week schedule has been produced. This schedule is very basic and can easily be added to for those looking for a more difficult workout. 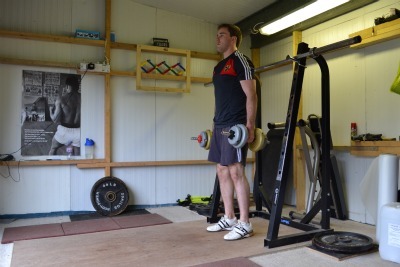 Additional sets including lifted and weighted push ups can be added to this programme too. The table below highlights the requirements of each of the three days included in the programme. Although these days are outlined as Monday, Wednesday and Friday they can vary as long as rest periods are included between exercise days. The three basic types of push up included in this schedule target different muscle groups, for some this may minimise the need for rest days. However the resting is not just for the working muscles but also the wrists and fingers which withstand a lot of pressure throughout the programme and essentially hold the individual’s whole body weight for large periods. For those unfamiliar with exercise terms, one push up is classed as a repetition or a rep. A set however is a group of reps.
For example, Monday of week one states six sets of 10 reps, this means 10 reps equals to one set and six sets equals 60 reps in total. Body Position – When working through your push up programme, no matter which variations you are performing, body position is important. 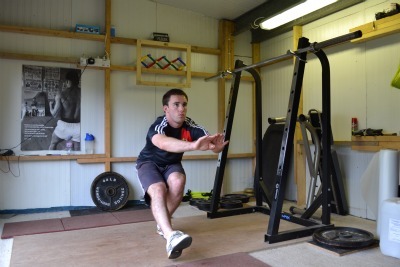 If you can’t maintain the correct body position throughout the programme then the benefits of the exercise will be limited. For the correct form time after time you should be looking to keep your body as straight and as stiff as possibly. 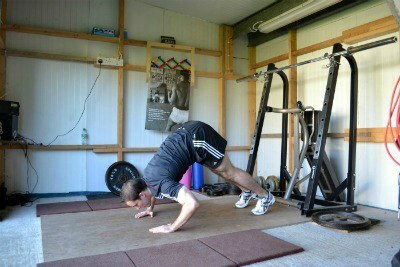 At first this may feel unnatural but the more push ups you do the more comfortable you will feel in this position. Breathing – The best way to control your breathing whilst doing push ups is to follow the rhythm of the exercise, this is a technique used by rowers as they use their strokes to control their breathing pattern. Breathing in whilst lowering your body towards the floor and then breathing out as you rise again will help with the exercise. This breathing pattern is essential for those looking to perform a large number of push ups at a time. Badly controlled breathing can have negative effects on performance with the individual concentrating more on inhaling and exhaling than the task in hand. Spread Your Palms – If exercising is uncomfortable then it is unlikely to be enjoyable so the best way to make your push up programme comfortable is to take the strain off your wrists. Section three of this article outlined three basic pieces of equipment which assist with push ups and the two sets of handles included in this section will help remove the strain from the wrists. However another top tip is to spread the palm of your hands, putting the pressure on your fingertips rather than your wrists. 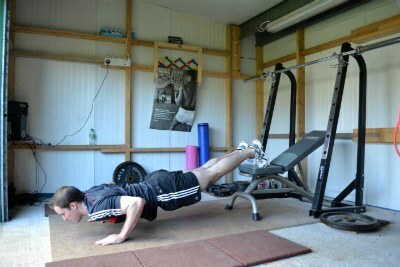 Over the course of time this will be hugely beneficial to those looking to complete a lengthy push up workout programme. The most helpful suggestion to anyone following this or any other push up programme is to increase your resistance, even if this means doing weighted or lifted push ups. Like with any form of exercise, if you keep on doing it to the same standard over a period of time then your body will become used to it. Take running for example, the first time you run a long distance your body may struggle to cope and it may take you a long time. However the more times you run this distance the easier it becomes, this is called endurance. For the majority push ups are not just about endurance, they are about increasing strength as well. If you put your body through the same routine week after week then it will become accustomed to it and the benefits will be reduced. This is perfect for people hoping to hit a particular target, maybe for a military exam or emergency services fitness test. However for those looking to add strength the resistance (body weight) needs to be slowly increased over a period of time. The best way to start this increase is to perform weighted push ups, starting with 5% of your own body weight. This shouldn’t be too much of a shock to your body but if you are used to performing push ups without additional weight then your working muscles will be able to feel the difference. In your own time you may wish to increase the weight, if you keep working out in this manner then your working muscles will develop in terms of strength and size as well as endurance. 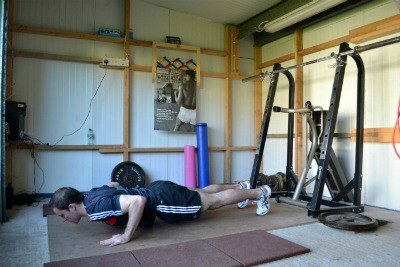 Let us know what you think of our push up article, have you used any of our workout suggestions? how is your training routine going let us know we love to hear your opinions. The abdominal exercise ball is great means of building the ab muscles while also strengthening the core section. What's more is that these easy ab exercises can be done almost anywhere with a bit of space and your ab exercise ball. The exercise ball may seem like a new piece of technology but it was invented back in the early 1960's by Aquilino Cosani he was an Italian plastics manufacture with no connection to fitness equipment in fact he was quite a heavy set gentleman. The original exercise ball was designed simply to be puncture free with the ability to be used in factory's saving time and money replacing air filled work balls, the balls where noticed by a British physiotherapist Mary Quinton she wanted to use the balls as therapy treatment for infants and newborn children. In the 1980's the balls where introduced into the fitness market and are still used to this day hence this article with suggested workout routines using the exercise ball. Over the past month we have been having fun with the exercise ball and tested a range of exercises that can be used with the ball, we have now been able to complete the exercise ball ab workouts plan to give you an enjoyable exercise training routine that is effective and fun! Lie with your body horizontal and with your lower back on a medium size exercise ball (in between your hip and knee in height). Place your feet firmly on the ground with your thighs perpendicular to your lower legs. Tilt your torso slightly back (approx. 10 degrees) and then crunch your torso upwards by approximately 45 degrees. Feel the burn in your Abs! Repeat this process for 3 sets and as many reps as your find capable. Lie face down on a medium size exercise ball (in between your hip and knee in height) that is pressing into you just below your belly-button region. 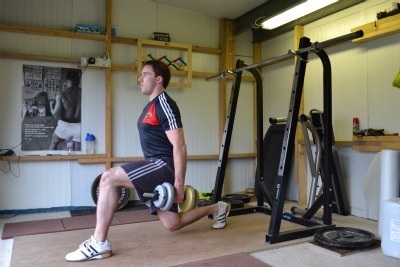 Hold your legs and body still by having your feet against a wall or secure in place by a training partner. Hold two 2kg dumbbells together in each hand in this position lying forward on the exercise ball. Now raise your rigid torso up while simultaneously bringing the dumbbells from in front to the hips in a circular motion. Hold this position at the top for 2 seconds. Feel a Burn in the lower back! Lie with your body horizontal and with your lower back on a medium size exercise ball (in between your hip and knee in height). Place your feet firmly on the ground with your thighs perpendicular to your lower legs. Tilt your torso slightly back (approx. 10 degrees) and then crunch your torso upwards by approximately 45 degrees. Now, at the top twist rapidly left and right! Feel the burn in your Abs! Repeat this process for 3 sets and in the 10-20 rep range. Lie flat on your back with your legs clamping the middle of an exercise ball. Raise the ball 6 inches off the ground, but your arms together in front of you pointing towards the exercise ball. Now slightly lift your upper body off the ground and crunch toward the exercise ball. Lie sideways on a medium size exercise ball (in between your hip and knee in height) with your feet together against a wall to hold your body in place. Using your arms to balance, Tilt your torso horizontally and then raise it back up while simultaneously squeezing the side abs (the oblique’s). Place your feet on a bench and your elbows on a exercise ball. Push the ball forward and back 6 inches for a minute. Your thoughts and opinions are very important to us, are you currently using a exercise ball for your workouts? if so let us know some of your techniques or how you are progressing now that you have incorporated an exercise ball. Like and share this article with your friends on facebook and G+ if you think our exercise information is good tell the world with a tweet. Your friends probably like fitness articles as much as you do, let them know about this one it only takes a second.